VeggieTales have been a positive influence in our home for years. 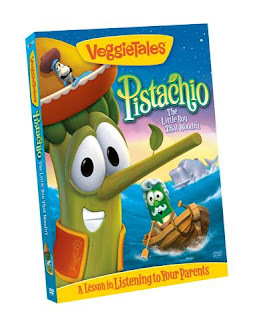 So I jumped at the chance to review the new VeggieTales Pistachio: The Little Boy That Woodn't. This movie promptly arrived on Friday and we used it for our family night. As expected, I was not disappointed. March, just in time for the spring season and Easter. My kids seem to have some issues lately with listening and following instructions, so I know I'll encourage them to watch this VeggieTales video. This would also make a nice Easter gift for your child. Big Idea is offering a special on a combo pack that includes the Pistachio video. For only $25 you get Pistachio: The Little Boy That Woodn't DVD, Silly Thing Called Love DVD, God Made You Special CD, and Christian Hit Music CD which includes free shipping. This is a savings of over 50%. For more information, visit the Big Idea website. Big Ideas has online games, activities, downloads, ecards, and more. I will need lots of activities to keep my three kids busy this summer so I will bookmark this site for unexpected crazy days. Have you watched the new VeggieTales Pistachio movie? Disclaimer: I did receive a copy of this dvd to review, but did not receive any monetary compensation. I strive to provide honest reviews on products we use.